After looking at the benefits of carrier billing in the United States and Canada last month, I have now run the numbers for the UK. The results are pretty similar. Comparative purchase rates for Pixelated Plus are shown in the above chart for the five largest carriers in the United Kingdom. Of these carriers, only O2 and Vodafone support carrier billing. Across all of these carriers, customers who have access to carrier billing are 2.3 times more likely to make a purchase. 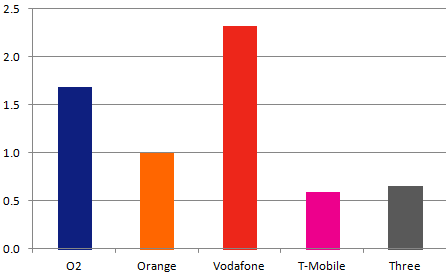 For a developer, a customer on Vodafone is worth almost the same as four customers on T-Mobile. Similar to the statistics for US carriers, the measurements in this chart are relative to the number of purchases at Orange (the largest carrier without carrier billing), such that Orange would always have a value of 1.00. The number of purchases is based upon purchases of Pixelated Plus from January-March 2012. Normalization for carrier size was based on data from the free application Pixelated over the same time period. All data was collected through BlackBerry AppWorld at the time of download.